Upon arriving in Sint Maarten, we realized immediately that things were just a bit off. And by off I mean it was different than home. I rarely travel, so I’m not very worldly. Anything different I notice right away and can’t let it go. First I will start off with the globalization. Sint Maarten has a lot of things that the States have. Also, it just happened to be the case that the Dutch side is the more touristy side. While the French side is more European. For example, the main currency on the French side is the Euro, while on the Dutch side they claim it’s the Netherlands Antilles Guilder, but really the U.S. Dollar has taken over in dramatic fashion–America! So right off the bat, it feels a little like home. That is until you see things like a Texaco station. 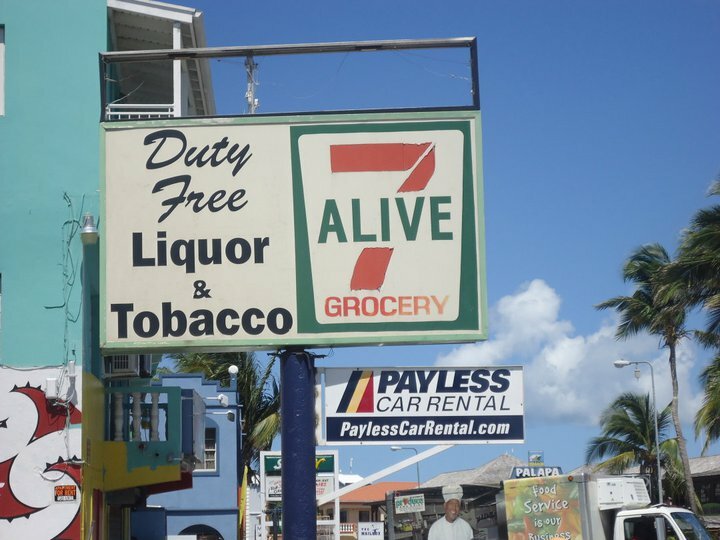 Or a 7-Alive instead of a 7-11. Also, there is no sales tax on the island. It’s the Delaware of the Caribbean! It’s all fun and games until someone gets hurt though. Or in this case, some one overpays at a restaurant. A word to the wise, when you get your check at the restaurant, it may help you to ask your waitress why there is a sales tax on your bill, when Sint Maarten is duty-free. Travel websites all over warn tourists that natives of Sint Maarten will sometimes try to trick American into leaving extra money even when there is already “sales tax” added onto the bill. Needless to say, my friends and I learned this the hard way at the first restaurant we ate at. Meow? Would you like to join us for lunch? This last point may not be weird, but its just something I’m not used to seeing in a populated area. Stray animals. I’m from a suburb of Philadelphia, when there is a random cat outside, it’s a big deal. My mom will go on a hunt for our outdoor cat to make sure he won’t be attacked. And even then that random cat might not even be a stray. It’s probably just our neighbor’s outdoor cat. But in Sint Maarten? Stray animals are every where. Dog, cats, whatever. Some looked mangy, sad or hungry. Some looked OK.
One afternoon while we enjoyed lunch in the capital, Philipsburg, a stray cat just sat at our feet. I knew this was trouble the minute I heard the meow. I love cats–well, all animals–so my spidey-senses went off immediately. However, my roommate Ilana has an irrational need for animal companionship. She wanted it immediately. Secretly so did I. Nothing says fantastic souvenir like a new pet riddled with whatever Caribbean diseases that reign free on the island. 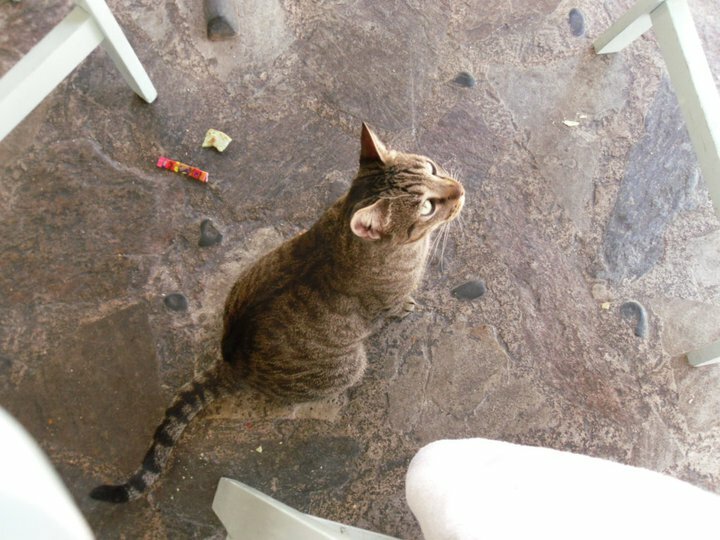 Some stray animals on the island become sort of like pets for restaurants–like the cat who snuggled at our feet at Taloula Mango’s in Philipsburg. While others just wander aimlessly.